The post 7 Amazing Facts About Your Dog’s Sense of Smell by Maria Goodavage appeared first on Dogster. Copying over entire articles infringes on copyright laws. You may not be aware of it, but all of these articles were assigned, contracted and paid for, so they aren’t considered public domain. However, we appreciate that you like the article and would love it if you continued sharing just the first paragraph of an article, then linking out to the rest of the piece on Dogster.com. People have known for millennia that a dog’s sense of smell is very different than ours. But science has recently learned all kinds of wow-worthy info about our dogs’ olfaction. 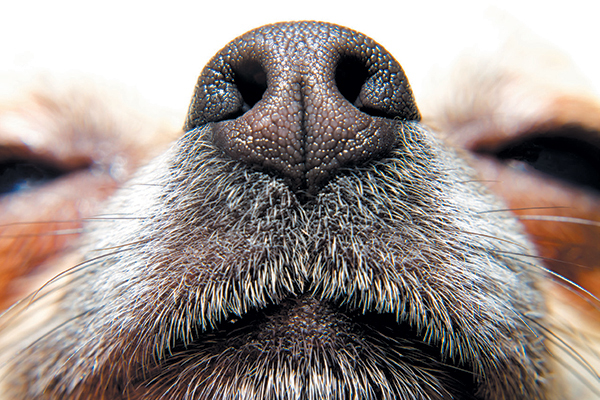 Check out seven of latest, greatest findings about a dog’s sense of smell. A dog’s sense of smell is much stronger than a human’s sense of smell. Photography ©BiMKA | Thinkstock. Yeah, you can read that two ways, but think back to what your dog smells like when wet, and you’ll figure out the right meaning. When it comes to nose sensitivity, dogs are the paws-down winners over humans. Numbers abound about how much better a dog’s sense of smell is than ours. There are so many variables that it’s almost impossible to quantify. I’ve seen figures indicating that a dog’s sense of smell is from 10 to 100 to 1,000 to 1,000,000 times better. Scientists I’ve spoken with say that dogs can detect some, if not most, odors at concentrations of parts per trillion. Psychologist and prolific dog book author Stanley Coren gave me an example of what that huge sniffer sensitivity looks like. Let’s say you have a gram of a component of human sweat known as butyric acid. Surprisingly, humans are quite good at smelling this. If you let it evaporate in the space of a 10-story building, many of us would still be able to detect a faint scent upon entering the building. Not bad, for a human nose. But consider this: If you put the 135-square-mile city of Philadelphia under a 300-foot-high enclosure, evaporated the gram of butyric acid and let a dog in, the average dog would still be able to detect the odor. With every step you take, you shed loads of skin flakes — kind of like the Peanuts character Pigpen and his ubiquitous dirt cloud. Real people have the same billow, only it’s made up of skin cells, which, when in this flake form, are known as rafts, or scurf. Get this: We shed 50 million skin cells each minute. Wow! “They fall like microscopic snowflakes,” Coren says. I am sitting here only moving my fingers on my keyboard because I really don’t want to shed, but no matter what I do, I’m just a snowstorm. Thankfully, we can’t see this winter wonderland ourselves. But these rafts and scurf, with their biological richness, including the bacteria that sheds with them, are very “visible” to dogs’ noses. Research indicates that it’s quite likely that a dog’s sense of smell can pick up fear, anxiety and even sadness. The flight-or-fight hormone, adrenaline, is undetectable by our noses, but dogs can apparently smell it. In addition, fear or anxiety is often accompanied by increased heart rate and blood flow, which sends telltale body chemicals more quickly to the skin surface. Trying to mask your strong feelings with a casual smile may fool your friends, but it’s not going to fool a dog’s sense of smell. I love this description of dog communiques from Coren: “Dogs read about the world through their noses, and they write their messages, at least to other dogs, in their urine.” It’s tempting to drag your dog along on a walk when he’s sniffing everything annoyingly slowly, but give him chance to read the neighborhood gossip column, and let him do a little writing while he’s at it. I look forward to sniffing out what they come up with next in regard to a dog’s sense of smell. Thumbnail: Photography ©Kira-Yan | iStock / Getty Images Plus. What Causes Nosebleeds in Dogs?